↑ "A book of or for notes", Retrieved 16 November 2010. ↑ "1. 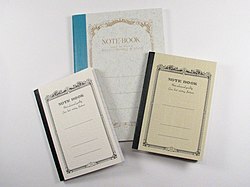 A book of blank pages for notes." Retrieved 16 November 2010. ↑ "A pad or tablet of usually lined paper. ", Retrieved 16 November 2010. ↑ "Beyond the Hills Hoist". Sydney Morning Herald. 27 January 2005.